The King is Dead! Long Live the Lich King! 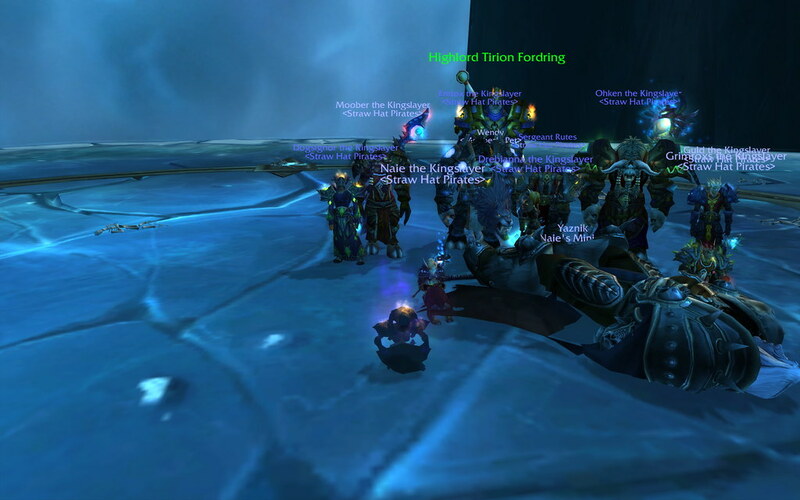 Last night, after 11 raiding nights, spread out over 5-6 weeks, at a cost of about $1,000 gold to those of us who came most nights (we had a few weeks with repairs turned on which was a blessing, but this is still our RL's ballpark cost), we defeated the Lich King.With 10/10 standing for the ending which feels pretty damn impressive to me for a first kill. This also meant I FINALLY got to experience the cut scene and the ending of the fight myself. The cinematic was a perfect end cap to the Wrathgate cinematic, and an effective closure to this expansion. Good job Blizzard. And thank you for keeping one of my favorite characters true to himself to the very end. Sniffle. That's all I am saying about the ending and the cinematic, to avoid spoiling it for anyone. And yes, at the end of the fight, I thanked my guildies for allowing me to make it through that fight to see the conclusion myself first-hand, without having it spoiled. The spoilers from twitterland prepared me somewhat for the ending but did not totally ruin the impact for me. So that's a good thing. And thank you for Naie after that incident for encouraging me to keep hope alive I could attain my personal goal, retaining the rallying cry I yelled every night 1 of every ICC raid we've done as a team. I took a ton of screenshots, none of which I am posting here as most are incredibly spoilerific, like this one. And I sat down on the stairs of the frozen throne for a very long time, and got screenshots there with some of my favorite raiders. I’m very happy I was able to encourage you, ICC wouldn’t have felt right without your battlecry. Thank you again, hon. And screenshot URLs have been sent. I would have taken more but I was sorta dazed from finally doing it. Can’t wait to see it for myself – pushed him into phase three a few times but due to lag, disconnects or not enough signups it just has happened yet, grr. Congratulations! It’s really a great fight! It felt like it took us forever, since we usually had a new person each night we went in, and broke it up with some weeks without LK attempts. But once you are consistently getting to P3 each time, you are so very close. Hope you down him soon! Thanks! It was a final boss fight like those of times past. Truly worthy of being the final big boss of the expansion.